YvesTrompe L'Oeil, murals and paintings can be found in celebrity homes such as Celine Dion and members of the Saudi Royal family. Yves custom designed hand painted Trompe L'Oeil, murals and ceilings embrace some of the largest and most exquisite estates throughout the US and Europe. Since the release of his book "The Art of Trompe L'oeil murals", his work has featured in numerous magazines publications and news paper articles. Yves Trompe L'oeil & Murals are available hand painted on site or on canvas, they are also offered Giclée on canvas up to 16ft. wide by any length and are sold throughout the world. 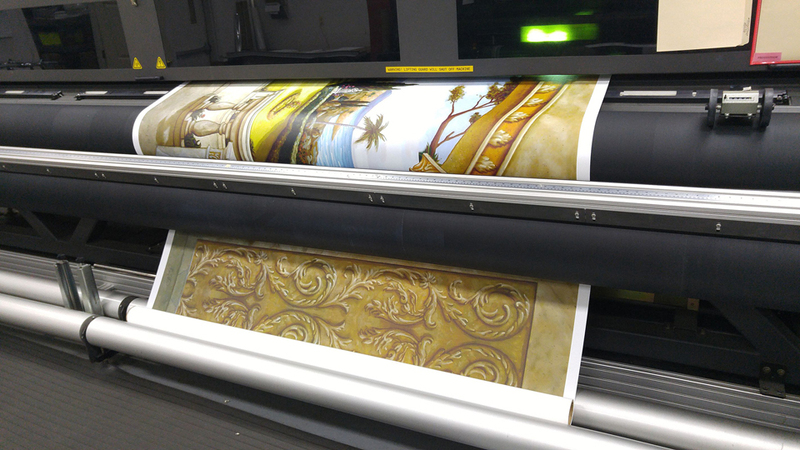 Giclée on canvas Murals and Ceilings available up to 16 ft. wide x 35 ft. long. 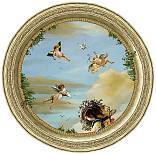 Gallery of Trompe L'oeil Murals and Ceiling " Giclée on canvas.
" Canvas Ceilings & Murals "
" Canvas Niches & Murals"
" Canvas Borders & Ceilings "
Click here to view the installed "Giclée" canvas mural on site.
" Hand painted Trompe L'Oeil projects. " " For a quote please contact us "
"Giclée" on canvas available. up to 35 ft long. Yves spent one month on the drawing table to come up with this unique design and months to paint this magnificent 35 ft. wide Dome. 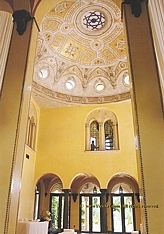 Yves created this unique Trompe L'oeil design and concept to maximize the space in this rotunda 30 ft. diameter. 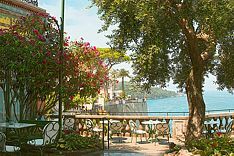 Italian Terrace Mural " Islamorada Estate "
available up to 96" w. x 128" h.
See video of "Fisher island" and "Celine Dion" Estate.
" Indianapolis Zoo/ Trompe L'Oeil Mural "
Butterfly Kaleidoscope Murals on canvas 21.5 ft. w. x 25 ft. h. installed at the entrance of the Indianapolis Zoo White River botanical garden. See a short video of "Indianapolis Zoo Mural" installed. 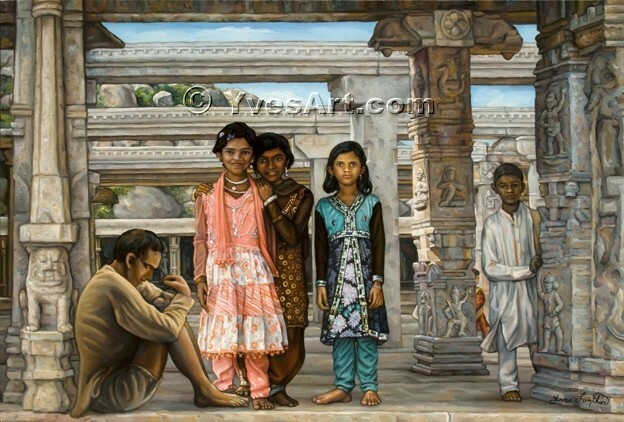 "Timeless Wisdom" is inspired from young girls Yves met while visiting a temple in Hampi / India, it shows the wisdom of children in India. Original paintings available or Giclée on canvas. Trompe L'Oeil DVD workshop & Online Streaming Workshop or Downloads. Trompe L'Oeil Giclee on canvas. you can also find some reproduction "Giclée" on canvas (up to 16 ft. wide X 35 ft. long) in the "Trompe L'Oeil Gallery". "True Giclée" reproduction now available on line for a fraction of the price. 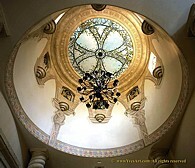 Click here: to see the photo gallery of installed murals & ceilings and what our clients had to say. Click here for our Copyright Notice. For more information call USA. (321) 257-9294. 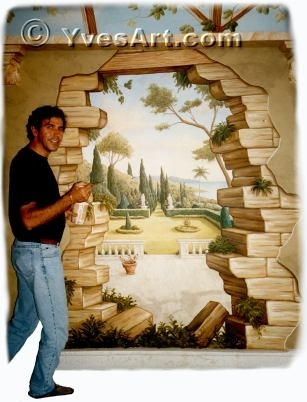 The Art Of TROMPE L' OEIL Murals. Capture the magic of Trompe L'Oeil! 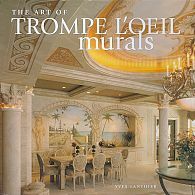 Ideas and inspiration abound in this exquisite book filled with stunning trompe l'oeil work by Yves Lanthier, master muralist for celebrities and owners of some of the most magnificent private estates in south Florida. Rated: Seeing is believing, and this is one book readers won't want to take their eyes off of! Description: PDF Portfolio, large photos of Yves Artwork & Trompe L'Oeil. To get email news update on new artwork and services release, click below and type your email address in the box and press submit.
" I use to dream of you everyday, not knowing that I would meet you some day.